Here are the corrected links from our newsletter, plus some bonus links. LONGMONT, Colo. (BRAIN) — BRAIN switched to a new platform for its weekly e-newsletter two weeks ago, and we are still learning the ins and outs of the new system. That, combined with a late night finishing pages for our Feb. 1 print edition, led to a technical problem with the newsletter that went out this morning. 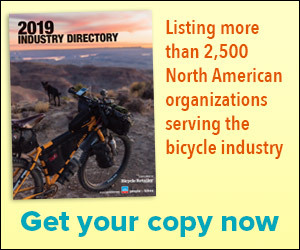 LAGUNA HILLS, Calif. (BRAIN) — The industry's source for contact information for manufacturers, distributors, events, nonprofits, service providers, and other bike companies and brands is now available as a digital flipbook. LONGMONT, Colo. (BRAIN) — A guest opinion piece by industry veteran Dan Sotelo was the most read article of 2017 on BicycleRetailer.com. LAGUNA HILLS, Calif. — Bicycle Retailer and Industry News is looking for retailers to participate in our 2017-2018 State of Retail panel. Shop owners, if you have opinions and want to your voice to be heard, this is the place for you. LAGUNA HILLS, Calif. (BRAIN) — Attention retailers: Friday is the last day to take Bicycle Retailer's survey on electric bikes. Please tell us what you think of their potential, and how much (if at all) they factor into your business.